Coleraine fans will be relieved to hear that Alan Stubbs looks set to be named St Mirren’s new manager. Reports coming out of Scotland suggest the former Hibernian boss has been offered the job on Thursday afternoon. The Paisley outfit have yet to confirm any appointment however, they hope to confirm the appointment in the next few hours with an announcement expected on Friday, if Stubbs accepts the offer. Bannsiders boss Oran Kearney and Stubbs had been the two front runners following interviews this week, with the Ballymoney man reported to have impressed the Buddies board. But St Mirren chairman Gordon Scott said on Wednesday the club needed someone with a working knowledge of the Scottish and English games, which would explain the decision to go with Stubbs, who has managed in both leagues. The news will come as a welcome relief for Coleraine fans though who didn’t want to lose Kearney. 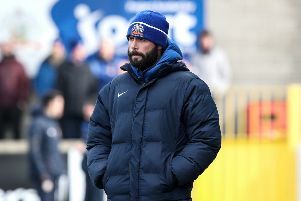 He has assembled a very talented squad at The Showgrounds leading them to Irish Cup glory last season, and going close to winning the Danske Bank Premiership also.